During last year's negotions to sell my one-person company, one of the things I wanted was some time off after the next version of FeedDemon was released. Being a one-man show was fun, exciting, challenging...and exhausting (especially now that I'm the father of two). So I made sure that the deal included a month off. Why am I telling you this? Because last week I started my month off. I had all sorts of plans to travel to exotic beaches and the usual vacation stuff, but in the end I decided to spend the first week puttering around the house. The only geek-related thing I did was play around with Vox - other than that, I've been running around with my kids, watching movies, reading books, and generally being a lazy bum. And you know what? I needed to be lazy at home for a few days, but now I'm ready to get out of town and be lazy somewhere else. So, I'm taking my family to some out-of-the-way tropical island, and after I get there I'll run around with my kids, watch movies, read books, and generally be a lazy bum (with frozen beverage in hand, of course). Apologies to those who are waiting for me to reply to an email, but I'm afraid it's going to be a little while before you hear from me. I'm unplugging completely for the next couple weeks, and I'm settling my mind into that wonderful place where email doesn't even exist. Really, it's no revelation when an RSS reader displays a river a news. 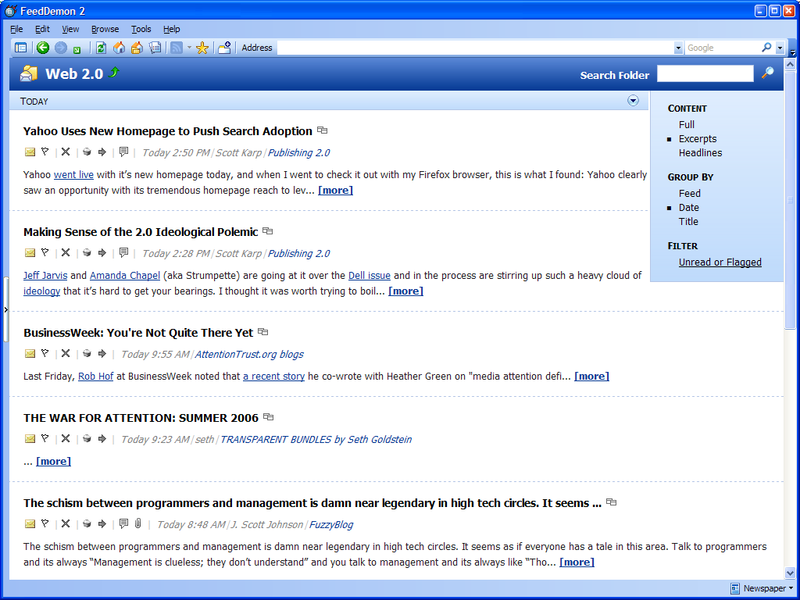 Many RSS readers offer this approach, either by default (as FeedDemon does) or through a bit of tweaking. But I've written about this subject before, and my opinion remains the same: while I believe the river of news approach is a great way to quickly scan for interesting articles, I agree with Chip Camden that it's often more useful to group new articles by their source feed. I need to put each article into context, so a steady stream of articles from different sources doesn't work for me. 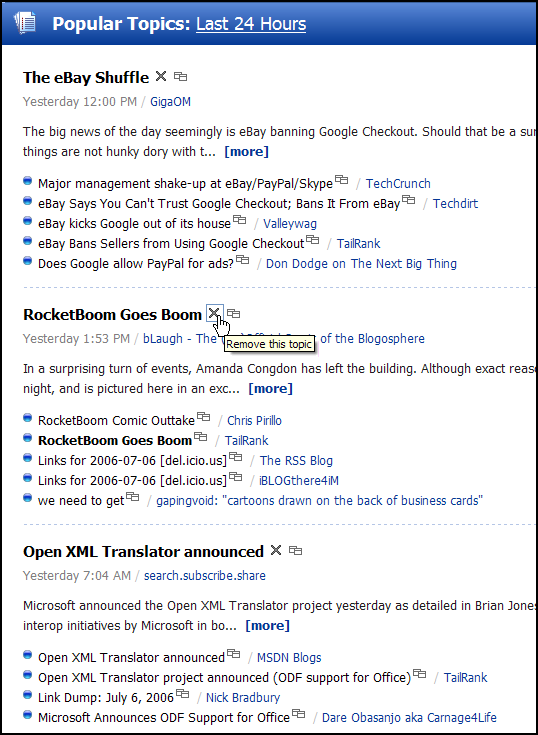 As this screenshot illustrates, grouping new articles by their feed is the approach I use with FeedDemon. But you don't have to stick with that approach - for example, here's a screenshot of the same set of articles grouped by date instead of by feed. And you can view an entire folder of articles, or you can view each feed one-at-a-time. Plus you can choose to view only new items, items posted today, items posted yesterday, etc. 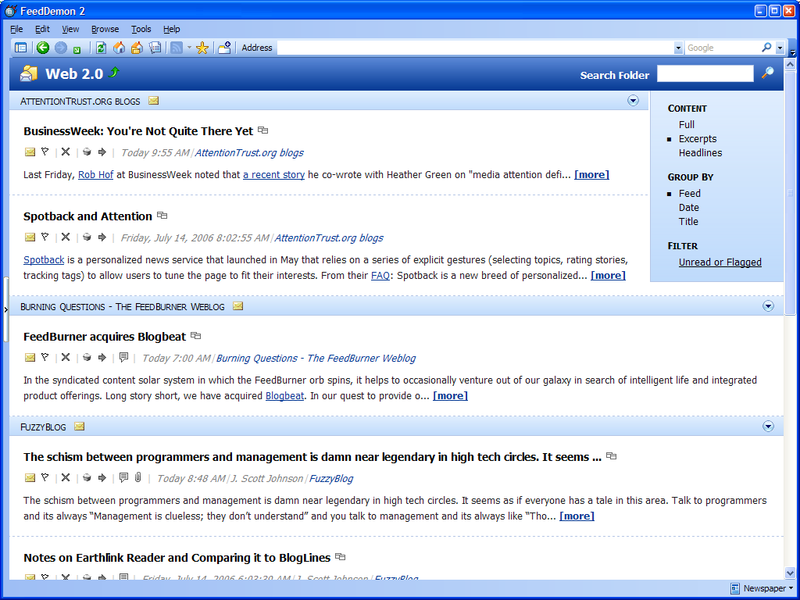 To me, the whole point of a river of news is to enable quickly scanning for articles that interest you, and the flexibility of FeedDemon's UI enables you to find the approach that works best for you - so Scoble can have his folder approach, Marc Orchant and Michael Gartenberg can have their per-feed approach, I can have my river approach, and you can have whatever approach you like (if you want, you can even make FeedDemon take a per-article approach so it works more like Microsoft Outlook). While we're on the subject, last week Dave Winer made this post about aggregators which force users to delete articles, and he also mentioned the fact that his reader doesn't enable searching previously downloaded articles. Dave, I get the impression that you aren't staying up to date with modern RSS readers, because several existing aggregators already address these concerns. For example, FeedDemon has never required deleting articles - by default, you only see stuff you haven't read, and older items are cached so that you can search them. As this cropped screenshot demonstrates, FeedDemon enables searching every cached article in your subscriptions (and you can limit the search to a specific feed or folder). Yesterday we celebrated our son Isaac's seventh birthday, and my wife arranged for a massive Jedi war amongst the kids attending the party. 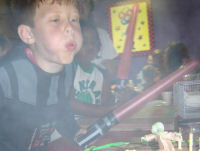 Each child was given a small, inflatable, illuminated light saber. Then the lights were turned out, and the Star Wars theme was blasted through the speakers. It was among the most chaotic scenes I've ever witnessed - over 20 kids battling it out while strobe lights illuminated an otherwise pitch black room. Kids were dueling all over the place, and while a few brave parents jumped into the fray with their own light sabers, most just hung around the edges hoping nobody would lose an eye in the mêlée. A number of the kids decided it was less fun to whack each other than it was to whack as many adults as possible, so they ran around smacking the adults with their tiny light sabers (grinning like crazed monkeys the whole time). No joke, I couldn't cross the room without being bashed at least a dozen times. This went on for 30 minutes without any break. It was hands down the most insane thing I've seen since that Sevendust concert I mentioned a couple months ago. Last month I talked about AQtime, a tool I use to locate performance bottlenecks in my code. One of AQtime's features that I neglected to mention is its comparison engine, which enables comparing the performance of different versions of the same routine to find out which one is the fastest. Among the most-frequently called routines in FeedDemon is one which returns the location of a feed in FeedDemon's internal database. This routine is called every time FeedDemon updates a feed, draws a feed on the screen, shows a feed in a newspaper, etc. (in other words, its performance affects the performance of a lot of other routines). When I first coded this routine, I did it very quickly so I could move on to other stuff, and I planned to come back and tweak its performance later. Of course, that never happened. So this morning I finally bit the bullet and used AQtime to compare various ways to boost the speed of this routine. Much to my surprise, I soon found one that was over 10 times as fast as the existing code. The lesson? It's a mistake to keep putting off the little things you could do to improve your application. I should've done this a long time ago, since it makes so many parts of FeedDemon even faster than they already are. Okay, it's time for a minor rant about a pet peeve of mine: I hate it when politicians talk about "average Americans," as though people who don't aspire to a career in politics are somehow "average." How many people do you know that like to be referred to as "average?" This practice afflicts the tech world, too. For example, while I agree wholeheartedly with this post by Scott Karp, the talk of "average people" made me grind my teeth. How about we use the phrase "non-geeks" (or "non-technical people") when referring to people whose lives don't revolve around their computers? That seems less condescending to me. Remember that WinINet bug I blogged about last month? Microsoft's David Pow left a comment stating that it's fixed, and the fix should be included in the final IE7 release, and most likely in Vista RC1 as well. This bug was causing a lot of problems for FeedDemon customers, so I'll be very glad to see it fixed. Now, given that the bug is an obscure one, it might seem strange that it affected so many FeedDemon customers. Here's why: the bug was triggered after connecting to a web server that uses chunked encoding and the server abruptly closes the connection. Turns out that Eric Meyer's server was doing this for a while, and one of his feeds is included in FeedDemon's default subscriptions (in the "Web Authoring" category). So the bug affected FeedDemon customers who stuck with the default subscriptions - in other words, a lot of people. Eric's server is now acting correctly, so problem reports related to this bug have pretty much dried up.